Anne Boleyn is the most popular and also the most divisive of Henry VIII's six wives. Some view her as an ambitious, social climber and home-wrecker who played a game and ultimately lost, others see her as a tragic victim of an egotistical tyrant obsessed with having a son, and still others see her as a queen whose views and ideals led to her making enemies who moved against her and brought her down in a brutal manner. 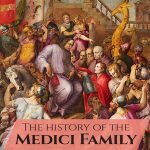 It's impossible to know for sure, but this 15-unit course (plus introduction) will lead you through her life step-by-step, from her family background and beginnings to her tragic death in 1536 and her legacy. Each part of her life will be fleshed out in detail by Claire Ridgway, founder of The Anne Boleyn Files website and author of The Fall of Anne Boleyn: A Countdown, The Anne Boleyn Collection and co-author of George Boleyn: Tudor Poet, Courtier and Diplomat, and several other Tudor history books. Claire also includes a unit on the myths surrounding this executed queen and one on how to research Anne Boleyn yourself using primary and secondary sources. 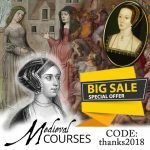 Each course participant also receives a free download of Claire Ridgway's best-selling audio book The Fall of Anne Boleyn, where Claire reads the unabridged version of her book in 75 parts. 354 minutes (5 hours 54 minutes) of video and audio lectures. 18 video lessons - streaming video plus downloadable audio mp3 files. 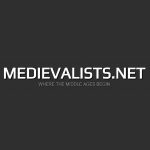 Resources - Where to find primary sources on Anne Boleyn and Henry VIII, family trees, links to articles and more information. Bibliography and further reading list. Claire Ridgway is the founder of The Anne Boleyn Files and Tudor Society websites. 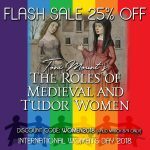 She has published eight Tudor history books, including The Fall of Anne Boleyn: A Countdown and The Anne Boleyn Collection, and is co-author of a biography of George Boleyn, Anne Boleyn's brother. Claire has written many guest posts for Tudor history websites and blogs, and has also written for History of Royals magazine. Claire has been researching Anne Boleyn and Tudor history full-time since February 2009 and enjoys sharing her research on the Anne Boleyn Files website and social media. She is currently working on two Anne Boleyn book projects and another on the fall of Catherine Howard. Claire can't get enough of Tudor history! It is often said, by those who look down their nose at Anne Boleyn and those who wants to see her as a “commoner done good” that Anne Boleyn had humble beginnings, but that just isn’t true. Claire examines Anne Boleyn's family background and the roots of the Howard, Boleyn and Butler families, and the idea that the Boleyns were descended from the Counts of Boulogne. Anne Boleyn was born before the formal introduction of parish registers for births, so we don’t know for sure when or where she was born. All we can say is that she was born in the first decade of the 16th-century. Historians generally date her birth to either 1501 or 1507, and there are valid arguments for each of these dates. Claire examines these arguments and the evidence given for each date, before looking at the places where Anne may have been born. Anne Boleyn was the daughter of Thomas Boleyn and Elizabeth Howard, and in this lesson Claire introduces Anne's parents and siblings. Claire looks at the education that children of Anne's status were given in the medieval and Tudor periods, as well as what we know about Anne's education. She also looks at Anne's time at Mechelen, at the court of Margaret of Austria. Anne’s time at Mechelen was cut short by her appointment to Mary Tudor’s retinue in 1514 and when Mary returned to England in 1515, Anne stayed on in France to serve Queen Claude. Claire examines this time in Anne's life and the impact that it would have had on her. In late 1521, Anne Boleyn was recalled from the French court to return to England to marry James Butler, and she made her debut at Henry VIII's court in a pageant in March 1522. Claire gives details of her debut and looks at the Boleyn-Butler marriage negotiations. Anne Boleyn was linked to two men before Henry VIII courted her: Henry Percy, son of the Earl of Northumberland, and the poet, Thomas Wyatt, a married man. Claire looks at what we know about Anne's links with these men. Part 1 - Claire considers Henry VIII's courtship of Anne Boleyn, looking at when it started, what it involved and what we know of it. She also considers the theory that Henry's courtship constituted sexual harassment. Part 2 - Claire examines Henry VIII's quest for an annulment of his first marriage, which became known as the Great Matter, the reasons behind it, the timeline of events between 1527 and 1532, ending with Henry and Anne's return from Calais in November 1532. Part 1 - Henry and Anne finally got married in January 1533 and a pregnant Anne Boleyn was crowned queen on 1st June 1533, but how did Henry get his first marriage annulled? Claire looks at the evets leading up to Anne's coronation and then gives details of the coronation celebrations. Part 2 - On Tuesday 26th August 1533, Queen Anne Boleyn ‘took’ to her chamber to prepare for the birth of her first child, who would, of course, be the future Queen Elizabeth I. How did Anne prepare for the birth and what do we know of Elizabeth's christening? Claire explains. 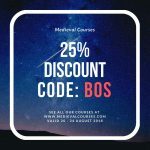 Claire examines the role of queen consort in the medieval and Tudor period, and considers whether Anne Boleyn fulfilled this role and what she did in her three years as queen. Claire takes us through the events leading up to Anne Boleyn's execution in 1536, from January to 14th May, including the trials of Norris, Smeaton, Brereton and Weston, and the rise of Jane Seymour. In this lesson, Claire examines the trials of Anne Boleyn and George Boleyn, Lord Rochford, the executions of the men, the end of Anne's marriage, her execution and the aftermath. Anne Boleyn's greatest legacy has to be her daughter, Queen Elizabeth I. In this lesson, Claire looks at Elizabeth's early life, how she may have been influenced by her mother, Elizabeth's rise to queen, whether she thought about her mother at all, and what her achievements were as queen. There are many myths surrounding Anne Boleyn. In this lesson, Claire considers some of these myths, what they're based on and how they can be challenged. Claire explains how anybody can research Anne Boleyn's life and times from the comfort of their own home, how to track down resources, how to use references and how to present the resulting research.